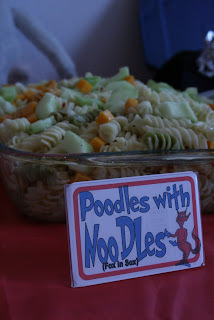 Well, here is the real live version of my Dr Seuss inspired party board. A Seussical time was had by all! The food was great and because I am slightly OCD in the party planning department we came up with names for everything we served and had little tags saying what it was and which book it was from! And the awesome dessert display! Since we had a pretty big mix of ages (from 1 - 87) we wanted really simple games and activities. We set up Finn's ball pit and tunnel activity set so the little ones could play. We also had crayons and giant coloring pages set up along with every Seuss book known to man for reading. 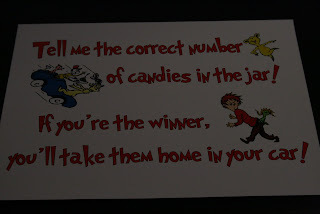 We had this sign and 4 jars set up in the entryway along with pieces of paper for people to guess the correct number of candies in the jar. These adorable cupcake toppers were made by Cassandra in her Etsy Shop! I found her by doing a request for Seuss ideas on Etsy and her concepts won me over. 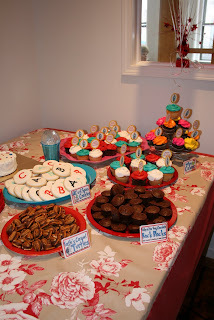 She went above and beyond to help me come up with a fantastic invitation and also these cute cupcake toppers. She was SO quick and easy to work with. I highly recommend her! Another Etsy find! 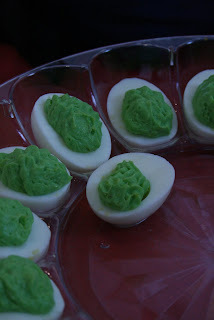 Along with my request for Seuss ideas came this BRILLIANT idea from Mommy's Little Critters. 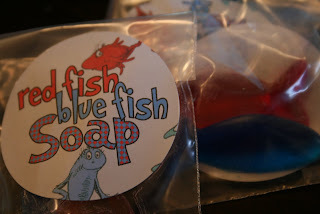 She made me red & blue fish soap! She was also awesome to work with, she gave me an endless list of scents to choose from, I went with cotton candy and blueberry. Even months later they still smell awesome and the kids thought they were very cool! I designed the cute favor tags and packaged them up and put them into the favor bags. And here are the favor bags! 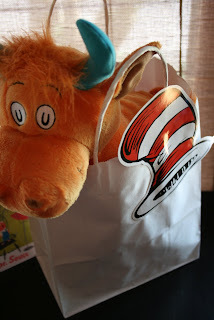 I ordered Seuss hat tags and glued them on to bags that we filled with awesome Seuss stuffed animals that we bought at Kohl's during their Kohl's Kids fundraiser... thank you so much to DentaLori for calling me to tip me off about this! Our original idea was to purchase Dr Seuss books for all of the kids at Costco, but they stopped carrying the 4 pack of board books just before I needed them! 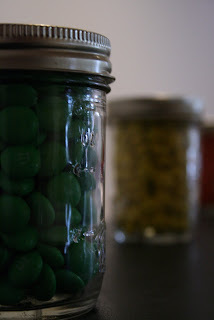 We also included m&m's just in case someone didn't win the count the m&m game above, they wouldn't be left out! 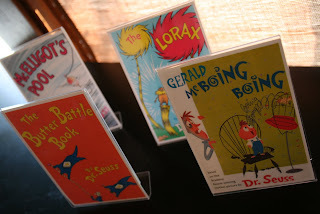 We printed images of Dr Seuss book covers and had them sitting on the tables. 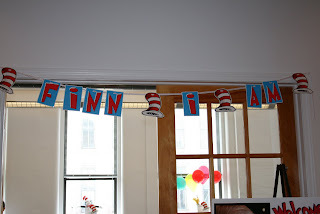 "Finn - I - Am" paper bunting I made and strung with some of the extra Dr Seuss hats I had left over from the favor bags. We had a table set up at the entrance with Dr Seuss' Happy Birthday To You book and this sign. 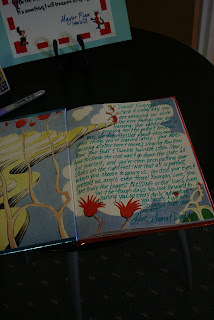 We asked guests to write a message to Finn on any of the pages and had lots of really colorful sharpie markers set up. There are some great entries and he's going to be able to keep the book forever. 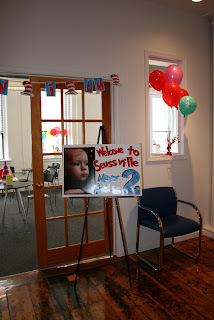 Sign in the entryway says "Welcome To Seussville! 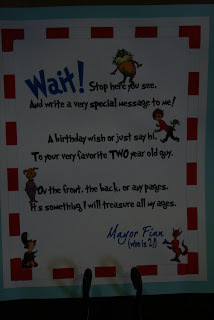 Mayor Finn is 2!" 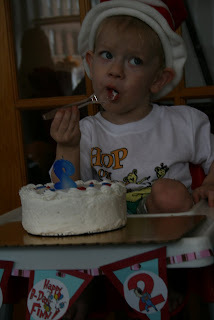 We had a smash cake for Finn... he apparently didn't get the memo that he was supposed to smash and went for a fork instead! I also had paper bunting around his high chair. He wore a Hop on Pop t-shirt. Daddy had a Wocket In My Pocket t-shirt. We also had Thing 1 and Thing 2 and other funny Seuss shirts show up. Aunt Lisey and Midge in their Seussical t-shirts! 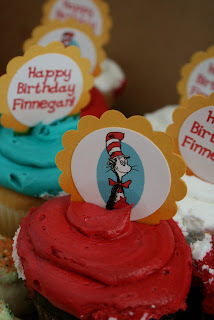 There are some unbelievably creative ideas you can do with a Dr Seuss theme. 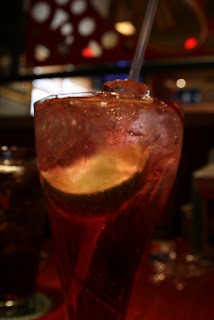 My biggest problem was narrowing down to the best stuff. I highly recommend it as a theme. So far *fingers crossed* I am in the Top 10 with votes. I'd appreciate your help staying there! 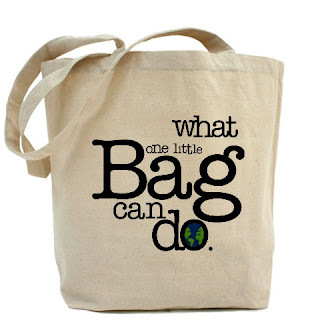 You can vote for any design once a day. The Kroger gift card prize would be awesome. Thanks!! 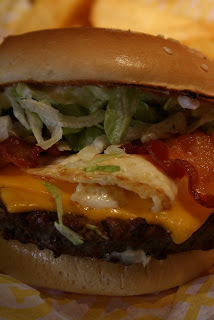 And I have been slacking on the giveaway stuff because we've had some stinking sickies around here and we've been crazy busy trying to get the house in shape for Easter. 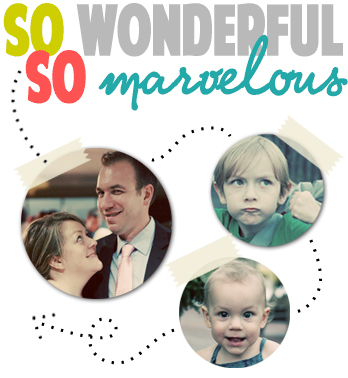 If you emailed me, you will have at least one special something, if not more! 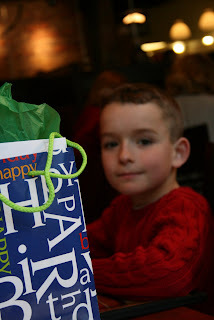 We celebrated my nephew Dylan's 9th birthday at Pizza Papalis. 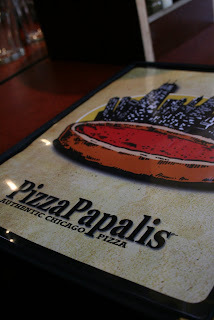 The pizza was amazing, though the deep dish looked a little scary for me, it was about 2 inches thick and that is just entirely too much cheese and sauce for my liking, but the boys enjoyed it. Dylan ordered chicken. At a pizza place. 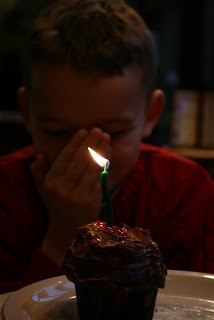 For his birthday. You can't beat being NINE. 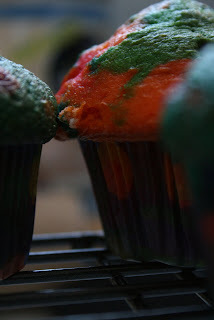 Lyndsey and I made technicolor cupcakes. They were very cool looking. Next time, I'll go a little less Jerry Garcia, but there will be a repeat or two in the future. Lyndsey did the mixing... there were a few pieces of gel coloring that weren't *quite* mixed in and resulted in some blue and yellow tongues. There are reasons she doesn't bake. They were still tasty. 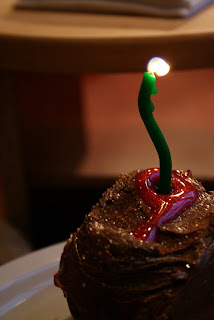 Especially when covered with chocolate frosting, a number 9, gold sprinkle sugar, and a twirly candle. In green (of course) because that is Dylan's favorite color. There was lots of singing and lots of embarassment. After all... he's NINE. And we are LOUD. 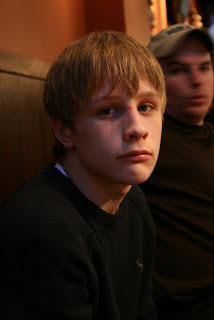 Aaaaaand last but not least... this is what FOURTEEN looks like. Ah, the angst ridden face kills me.